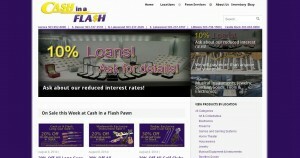 Cash In a Flash address, phone, website, hours of operation, and more. Cash In A Flash Pawn is a locally owned business that has provided customers with an excellent pawn and loan experience for 18 years. Whether you are selling, obtaining a loan, or looking to buy our high-quality merchandise, we are ready and willing to meet your needs. Our customers come from all walks of life, of varying income levels, and all ethnicities – basically anyone who is in need of some quick, easy cash to assist with any financial circumstance. No amount is too large. If you are in the market to buy gold and diamond jewelry, watches, tools, firearms, electronics, musical instruments and equipment, cameras, game systems, video games, DVDs, or other professionally refurbished items. We’ve got the brand-names and high-quality items you’re looking for. Looking for a special piece of jewelry? We can help you pick out that special something for your significant other at a fraction of retail costs. Please visit any of our stores to browse items in our inventory. To adequately serve our customers, we have expanded into six stores across the Denver Metro Area, including Aurora, Southeast Denver, Littleton, North Lakewood, South Lakewood, and Castle Rock. Or, from the comfort of your home, check out our online offerings, which allow you to browse selected inventory from our six stores through one eBay site .